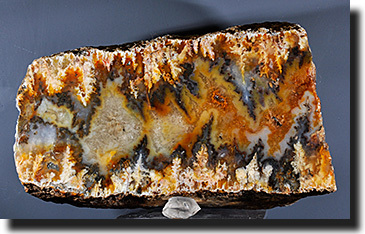 A well-known seam agate. This particular form of agate comes from the Owyhee Mountains of Oregon. Plume agate gets its name from its beautiful plume like shapes. The colors range from a creamy white to yellow, pinks, reds, and different shades of blue. Iron pyrite can add a nice touchof sparkle. Inclusions of browns and blacks from other minerals. Create fascinating scenes for the imagination to play with. We have many of the various types and colors of plume agate found in this area. Some of our Idaho friends tell us this agate was found on our side of the border too. We also have some or the Regency Rose variety. The Regency Rose mine is located within the Graveyard Point area and was mined in the 1970's by Teepee Rock Shop in Marsing, Idaho. The Gem Shop claimed the area in 1996. Regency Rose Plume is known for colorful plumes of yellow, gold, red, orange, pink, and white in clear or bluish agate. Graveyard Point Plume agate comes from the Owyhee mountain area, situated on the Idaho, Oregon border. Along US 95 just south of Homedale Idaho. The Owyhee River begins in northern Nevada and flows north. Close to the Oregon, Idaho border. It eventually empties into the Snake River just south of Nyssa, Oregon. 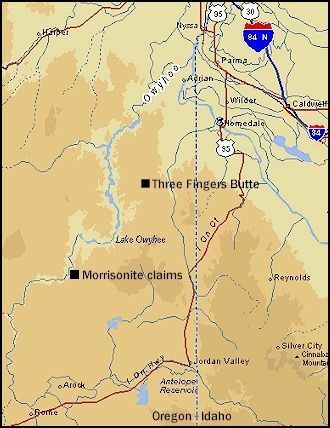 About 25 miles northwest of Jordan Valley, Oregon. The river abruptly turns east for several miles, makes several loops and then turns north again. It finally flows into the Owyhee Reservoir. This is Eastern Oregon's high desert country in Malheur county. Many types of picture jasper, plume agate, petrified wood, rhyolite, colored agates and saginites come from this area. This area is loaded with fun stuff. This area even spills over into Humboldt County, Nevada. Because of the abundance of gemstone that is found in this area. You will see this same site information on many of our pages. Just as a general reference to this fantastic area. We aren't as familiar with the exact digging areas as folks like "Oregon Rockhounds Online"http://www.orerockon.com If you are planning a trip to dig in this area. You may want to click the above link. They have detailed travel instructions and some very nice pictures of these areas.